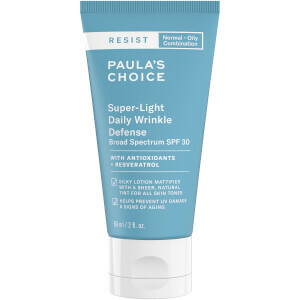 Paula's Choice Resist Perfectly Balanced Foaming Cleanser is an anti-ageing cleanser specially formulated for combination to oily skin types. Its oil-controlling formula creates a gentle foam to effortlessly remove dirt, make-up and impurities, leaving you with a refreshed complexion. Combining ceramides and hyaluronic acid, the advanced cleanser repairs and preserves the skin's barrier to fight wrinkles, without stripping moisture or uncomfortable tightness. Experience smooth, rebalanced and younger-looking skin with an even tone. E.N. Splash the face and eye area generously with tepid to slightly warm water. Spread a small amount of cleanser (1-2 pumps) over your fingers and apply to facial skin and the eye area with gentle circular motions. Rinse well and pat dry with a soft towel. Aqua, Sodium Lauroamphoacetate (cleansing agent), Sodium Cocoyl Isethionate (cleansing agent), Stearic Acid (thickener), Glycerin (skin-repairing ingredient), Glycol Distearate (opacifying agent), Helianthus Annuus (Sunflower) Seed Oil (non-fragrant antioxidant plant oil), (skin-repairing ingredient), Ceramide NP (skin-repairing ingredient), Ceramide AP (skin-repairing ingredient), Ceramide EOP (skin-repairing ingredient), Phytosphingosine (cell-communicating ingredient), Phospholipids (skin-repairing ingredient), Sphingolipids (skin-repairing ingredient), Lecithin (cell-communicating ingredient), Arginine (amino acid water-binding agent), Cholesterol (skin-repairing ingredient), Aloe Barbadensis Leaf Extract (water-binding ingredient), Disodium EDTA (chelating agent), Sodium Chloride (stabilizer), Sodium Hydroxide (pH adjuster), Sodium Lauroyl Lactylate (emulsifier), Cetearyl Alcohol (thickener), Acrylates Copolymer (thickener), Xanthan Gum (thickener), Carbomer (thickener), Caprylyl Glycol (preservative), Hexylene Glycol (preservative), Phenoxyethanol (preservative).